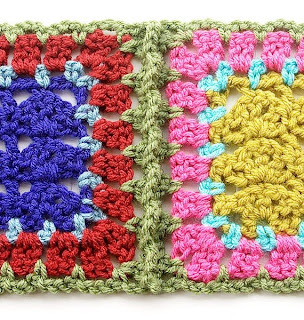 This method simulates a braid join and is accomplished by crocheting pre-edged blocks together. It's fast and easy but uses more yarn and creates a ridge on the back between squares. Step 1: Edge each square according to instructions for Step 1 of Flat Braid Join. Step 2: Using matching or contrasting color, hold two squares right sides together matching up corners. Working through both thicknesses, join with sc in first corner, (ch 3, sc in next ch-3 sp) across ending with sc in corner. Pick up next two squares and continue with sc in first corner, (ch 3, sc in next ch-3 sp) across. Squares can be joined in long strips or just two at a time, as you prefer. Dont feel overwhelmed! Lots of people arent "caught up" if that even matters, just have fun! Ive decided on simulated braid. I've done the other two before and have never used this one. So Im off to do sc, ch3 around all the blocks before I begin joining rows. I like this one too! Just have to do the last four rectangles, then it will be assembly time! To those of you that are behind - don't worry! There's no prize for the first one done! This project is supposed to be fun - no stressful. The prize will be the finished gorgeous afghan - no matter when it is finished. Ive got a little more joining I hope to finish tonight, then I will be ready for border rows. I had done all the squares and added a row of doublecrochets in every stitch and then slip stitched all the squares together - but I think I will undo it and use this simulated braid join. While others are still doing - I will be "undoing" - bet we finish around the same time! Thank you so much Carolyn for the different ways of joining. 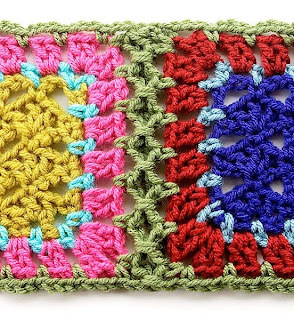 I'm still learning as I have never joined any squares so I am happy you shared this with me. I'm still far behind on the squares but getting there slowly. I appreciate your sharing so I can learn! I've finished joining all the blocks. The line on the back doesn't bother me and this one seemed to be the quickest, which is what I look for! I didn't make any extra blocks, so I used Carolyn's original setting with the 18 squares and 12 rectangles. Awaiting Carolyn's ideas for the border! I'm going to try the flat braid joining for my afghan...but I really like this one, too, and plan to use it to join squares for some pillows when I get the afghan finished (which might be awhile as I'm in "catch up" mode...). Hello! I am a crochet designer who loves all things yarn, hooks and needles. I live and make things daily in a tiny house in the Texas hill country with my husband and assorted pets. Thanks for visiting!